One way that J and I have been pretty lucky since the addition to our family is that we haven’t needed to use daycare. We work opposite schedules, so there’s always somebody home. On the plus side, we save A LOT of money. On the downside, L doesn’t get to socialize very much outside of our house. J found a one day a week toddler class for L, so we can get her out of the house away from J and I to interact with other kids her age. The class is in the morning, so that means I get drop off and pick up duty while J is at work. After dropping L off at her first class, I was left with two hours alone to kill. That hasn’t happened in quite a while, so I really didn’t know what to do with myself. I don’t usually eat much for breakfast because I’m too busy making breakfast for L and trying to stay awake after nights of very little sleep. Since I had time, I figured I may as well pick up a breakfast sandwich for myself. I see J goes to Big Apple Bagels quite a bit for breakfast and there was one close to me. 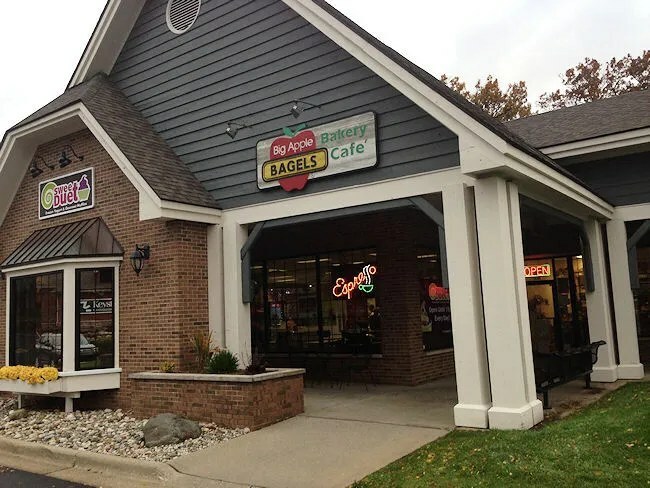 Big Apple Bagels has four Kalamazoo area locations. I have picked up lunch from the Westnedge store before, but I haven’t been to the other three. The one I was closest to was the Portage location on Centre Street near US-131 in the Woodbridge Shopping Village. The store is a combo store of Big Apple Bagels and the company’s new Sweet Duet frozen yogurt shop. The space seems kind of tight but that could be there were quite a few people stopping in for their morning coffee and a little breakfast before heading out to start their days. I was just in the market for a breakfast sandwich and I found my favorite right away. I ordered the Southern Tradition. 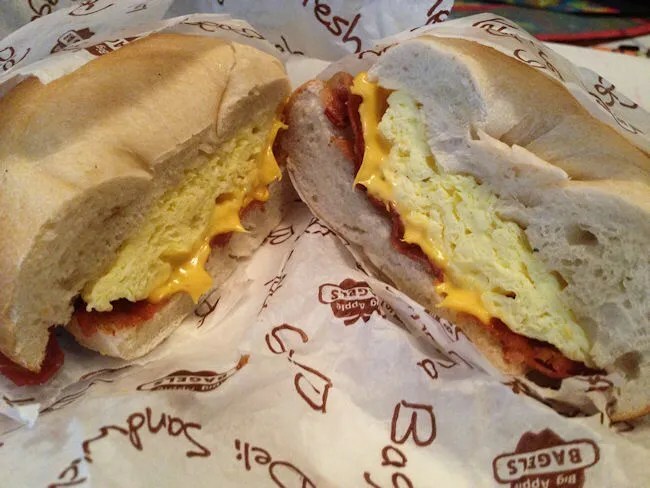 The sandwich is scrambled eggs and American cheese with choice of meat on choice of bagel. I chose bacon for my meat and just stuck to a plain bagel. I was given the option of toasting the sandwich and I said yes to that too. The sandwich cost me less than $4.00 and I barely got through a few screens of my Twitter feed before I heard my name being called. I grabbed the bag and headed home to watch Let’s Make a Deal….not Sesame Street for the first time in quite a while. As I sat down on the couch to laugh at Wayne Brady, I pulled the sandwich out of the bag and was shocked by how big the egg portion of the sandwich was. The mound of eggs actually made for a pretty hearty sandwich, but not so much that eggs was all you could taste. I’m glad I went with the toasting option because the crunchy edges made the sandwich just a little bit better than it already was. Can’t complain about this sandwich. It was delicious. 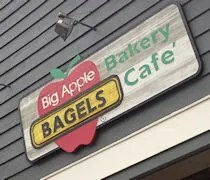 Big Apple Bagels isn’t usually on my radar because I don’t get out of the house much in the morning. I know they have lunch sandwiches and I enjoyed it the one time I did stop for lunch, but bagels just makes me think of morning, so it never pops up to me as a lunch option.